Taylor Thum, a third-year film and animation student, is building a new platform for live-action storytelling. Great storytelling is at the heart of powerful filmmaking, according to RIT student Taylor Thum. And her commitment to changing the way that people are captivated by powerful stories is the impetus for her partnership with MAGIC Spell Studios. 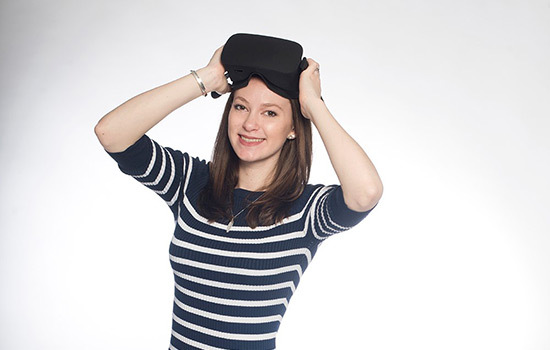 Thum, a third-year film and animation major from Franklin Lakes, N.J., is using her enthusiasm for live-action, virtual reality and 360-degree filmmaking—as well as the countless opportunities provided by MAGIC Spell Studios—to design and build a new platform for live-action storytelling. The end result will allow viewers to experience VR and 360-degree films without wearing a traditional virtual-reality headset. Thum hopes that her design will come to fruition and be commercialized in the next year, showcasing eye-catching documentaries, animation, games or live action using this new and innovative platform. Last year, Thum was part of a collaborative team of RIT students from the game design and development and film and animation programs who created an interactive app that allowed Buffalo Bills football fans to experience New Era Field in a 360-degree immersive environment. This included walking onto the field through the tunnel and seeing inside the locker room. The app was the first of its kind in the NFL. This kind of multidisciplinary collaboration at the intersection of technology, the arts and design remains a key component of the MAGIC Spell Studios effort.